Plainsong (5 stars): In the last few weeks of 2018, I spent time reading a lot of posts around best reads of the year and added content to my TBR. Somewhere along the way, I picked up Plainsong. I don’t know who recommended it or what they said that made me add it to my list. Especially since it’s a book that was published long before 2018. Whoever it was, thank you. This book was a pure joy to read. The characters, the dialogue, the atmosphere of the book all come together to envelop you into the story. Much of the book is sad and has real, raw, and bad things happening to several characters. But underneath all the realness of life there is this thread of hope that emerges from the quiet goodness of other characters. The way people express their feelings, their thoughts, their worries feels so true to character. The overall quietness of the book was something I cherished the whole time I read it. Especially after Uprooted which was lovely in its own right but certainly not quiet. I have never read this author before and I have no idea why. I was very sad to find out he’s passed away but grateful that he’s left a body of work. I look forward to spending more time with his words in 2019. Talking Across the Divide (4 stars): After the last two books I finished, I needed a change of pace so I decided to pickup a nonfiction book. This was new on my pile and I liked the premise of it so I figured it was a good pick. The reason I gave this 3 stars is really because there wasn’t much new here for me. I’m lucky enough to have a wide range of interests and friends from a wide range of backgrounds. This has taught me that people I love and respect can have wildly different opinions/perspectives than I do. Having such a variety of people in my life has helped me work on some of these tactics and has helped me be more open to listening because as Brené Brown often mentions, it’s hard to disregard someone’s thoughts/opinions/words if you know them as a human being. Not that I always get it right, of course, but I’ve done a lot of growing up in the last twenty years and I am aware that things are a lot more complicated than they might seem and I have but my stories, perspectives, experiences so it’s important for me to remember that those are not the only ones there are in the world. Anyhow, these are good books for me to read. Good reminders to keep an open mind, to listen, to care, to remember to not perpetuate a divide. As my favorite Ram Dass saying goes: We are all just walking each other home. A Key to Treehouse Living (3 stars): Most people who review this book start with its unusual style. The book is written with alphabetic titles as if you’re reading an encyclopedia. I’d read this style before in The Lover’s Dictionary which at the time had delighted and surprised me. Maybe because of that, in this case I felt like it was mostly a gimmick. I’ve read a lot of books so the gimmicks don’t do it for me anymore. I much prefer novels that have deep, rich characters and solid writing. To be fair to the author, this book is written well and even though all the other characters are ephemeral and not developed much at all, the main character here is layered and complicated. I also liked the writing. I highlighted this little sentence that made me smile: “An old man with the need to ruminate will pop like a champagne bottle when you ask him a question and stories will come out like the foam.” I like how it was both so visual and so relatable. Had the author trusted his ability to write strongly and develop rich characters, and made this book less gimmicky I probably would have rated this higher. Still really enjoyed it and look forward to seeing what he comes up with next. Bad Blood (4 stars): This book showed up in my life in so many ways that I couldn’t continue to ignore it. When my book club picked it months and months ago, I thought it would be a boring, sensationalist read. I live a few streets down from where Theranos was. I work in Silicon Valley and all the little cafes mentioned in the book are in my neighborhood. I figured I knew all I needed to know about this story. Then it started popping up all over my Instagram feed by several bookgrammers I follow. My friend whose judgement I generally trust said it was a really good read. And then the clincher was when my brother-in-law said he was up until 2am reading the book and that it was one of his best reads of 2018. I finally succumbed to the universe and bought the book with my audible credits. It took me a little less than 24 hours to finish because this book is written in a way that makes it very hard to put down. Even when you know half the story. The number of unconscionable acts in this story are appalling. The fact that the house of cards didn’t come down for as long as it lasted in quite mind blowing. But what made me the saddest reading this book wasn’t even Holmes’ actions. She clearly lost her way at some point and decided to put her greed above anything else and that part of the story I knew (even if I didn’t know all the bullying, secrecy and just outright creepy things she did to her employees.) What caught me by surprise was the way in which people/companies came on board even while suspecting there was something off. They were so worried about their FOMO that they chose to be a part of fraud rather than miss out on something real. Walgreens was worried CVS would do the deal if they didn’t. The number of times people say But what if we pass on this and it’s real blew my mind. Couple FOMO with a charismatic, passionate, successful-looking female CEO and you have yourself a perfect smokescreen. One she took advantage of to its fullest extent. Parts of this story made my skin crawl. And other parts were more like facepalm. I don’t know whether to be grateful that the journalist kept pushing until it finally fell apart or horrified that it took as long as it did. Some Assembly Required (4 stars): This was the only non-fiction Anne Lamott book I haven’t read, so when the library added the audiobook, I put it on hold immediately. Anne Lamott reads her own audiobooks and they are a joy to listen to. I am not a grandmother yet (and not for a long while I hope) but here’s what I know about Anne Lamott: there’s wisdom in all of her books regardless of topic so I knew this would be no different. Anne Lamott is neurotic, difficult, selfish, and struggling in all the ways the rest of us are. She’s human, she’s fallible, she’s flawed. And yet she’s also wise. She surrounds herself by other wise people and she puts all that vulnerability into her books. So when you read her books, you see the mess that life is, you see someone being honest with you about her own struggles, and you connect with her humanness. And I am grateful for her openness, for her willingness to be vulnerable so I can feel less alone and so I can grow and benefit from her wisdom. I am always grateful to read one of her books. This one had the added advantage of including bits and pieces of her son Sam’s thinking. It’s so lovely to have read Operating Instructions: A Journal of My Son’s First Year and now to hear the baby from that book speaking as an adult with his own baby. The Happiness Project (3.5 stars): I joined netgalley in 2009, and then proceeded to do nothing for ten years. Last Monday, I finally decided to dig up my login information and see if I can start using it. The Happiness Project was the first book that accepted me so I decided it had to be the first one I read. Apparently this is not the first book, so the author jumps right into the story without giving too much of a background on each of the characters. This didn’t bother me at all, though I will say by the end of the story I still couldn’t really tell you much about the physical characteristics of any character except that one of them is pretty petite. This, too, wasn’t a huge problem for me. I did feel like I got to know each of the characters as a “person” and they felt uniquely different from each other, and reasonably three-dimensional to me. They were flawed, interesting, thoughtful characters. The book was a fun and quick read. When I was reading it, I liked getting lost in their stories and when I wasn’t reading it, I found myself looking forward to reading more. While there were some learning moments for each character, this wasn’t a story of major growth. When they first make the “Happiness Project” I thought it would end up being that they would each learn something about what happiness meant for them and how their project/goal would shift with the learning etc. but it wasn’t a book like that. It was light, fun and one of those books that come together beautifully at the end, leaving you smiling and happy. If you’re looking for a deep, literary book that will make you learn about new cultures, or appreciate complex characters, I wouldn’t recommend you pick this one. But if you want to have fun, enjoy a good story with characters that are real and experience real-life situations, especially around marriage and motherhood, I think this is a fantastic pick. I gave it a 3.5 stars because while I would have liked a bit more depth, I really enjoyed the story and had fun the whole time I read it. Chief Joy Officer (3.5 stars): 3.5 stars but I decided to round up this time partly because I am so happy leaders like this exist and I want to encourage these types of books to be written more and more and I want other leaders to take their cues from this type of advice and leadership. I’ll start with what I liked: I liked all the examples of how the author’s company works and how much time and effort and, most importantly, thoughtfulness they’ve put into the process of making decisions that serve their purpose around creating a more joyful and collaborative company. It sounds like it’s clearly a wonderful place to work and I have subscribed to their newsletters and earmarked it as a place I’d love to go visit when/if I make it to Michigan (which I am decidedly likely to in the next 3 years.) I am a firm believer that such environments don’t happen magically. It takes a lot of effort, dedication and intentionality. Now, the part I wish there was more of was specific to me. I work at a large company and I run operations for a reasonably large organization where I was hoping I could take away some tangible, interesting ideas from the book and start recommending that we implement them (or at least experimenting with them) in my organization. Alas, with the exception of one small idea, I didn’t walk away with anything else. Partly because some of his suggestions are things I am already working on and partly because it was hard for me to envision how to integrate some of his other ideas into our organization. But this is not to say there are no ideas in the book, just not a major aha! moment for me. All in all, it was a worthwhile read and I am looking forward to tracking the company for a little while through their newsletters and seeing if I get some gems there. And super grateful companies like this exist. Can You Ever Forgive Me? (2 stars): This came up on my library hold so I decided since it was a quick read, I could go ahead and tackle it. I wanted to read it before I see the movie. Because I refuse to see movies without reading the book and I knew I wanted to see this one. The book left so much to be desired. There’s nothing to learn or even something to enjoy in this book, for me. While some of the tidbits of the letters she wrote were fun to read, I felt the lack of any emotion, any remorse, or even anything that made this person real for me, stopped me from connecting with the author at all. I understand this is a true story and the truth likely is that she didn’t feel remorse and that she didn’t have a big, amazing reason why she did what she did except that she could and she needed/wanted the money. Sometimes the truth is as simple and straightforward as that. That doesn’t mean I have to like it and it doesn’t mean it makes a good story. At least not for me. I will still likely watch the movie, though I am decidedly less excited to do so now. I’ll start with part of the book’s description that totally made me mad: “An explosive portrayal of teenage life from the perspective of The Bad Friend…” what?! This is a terrible description for the book I read. There are few things that make me angrier than reading blurb copy that was written to raise curiosity/to sensationalize and then book ends up being something completely different and now you’re disappointed not because the book was bad but because the blurb set the wrong expectation. The first sentence of the blurb here in goodreads is closer to the truth of this book: “It’s 1997, and 14-year-old Juliet has it pretty good. But over the course of the next two years, she rapidly begins to unravel, finding herself in a downward trajectory of mental illness and self-destruction.” but really if I were explaining it to a friend, I’d say this is a book about a 14-year-old who is suffering from several forms of mental illness, most specifically being bipolar. It’s the story of her trying to (or her parents forcing) to find her way back. It’s raw and honest and disturbing in all the ways life can be when you’re suffering from mental illness and are also a teenager. She is not a “bad friend,” she’s just a girl who’s struggling so very deeply and keeps making choices that don’t serve her because she’s sick, because she’s struggling, because she’s lonely, because she feels “not right” inside, because…well for all the reasons many of us struggle during some of the most formative years of our lives. I can’t relate to any of what Juliet does in this novel (side note: or is it non-fiction? I could never be sure and still am really not. If it’s meant to be a novel it would have been better served by the main character having a different name. in my opinion this only serves to confuse the reader and doesn’t add to the story.) I didn’t take any drugs or really much alcohol during my teen years. I don’t want to give away much of what happens in the story (even though I think the things she “does” isn’t really what the story is about.) But I could relate to her anyway. I could relate to her suffering. I could emphasize with her. The writing was so real that I could almost feel it crawling under my skin. What was most interesting to me is that I alternated between reading the book as my teen-self and as my parent-of-teen self. I don’t even have a daughter but there were parts of the book where I got so mad at her for continuing to self-sabotage and make choices that wouldn’t stop hurting her. I felt angry and frustrated and wanted to stop reading. And then there were other parts that brought me right back to my own old teenage self where I could connect with her feelings of emptiness and pain. Clearly, this book left an impression on me. I will say that I didn’t want to be reading it as I was reading it. It was painful and raw. I didn’t want to watch her as she was doing so much harm to herself and others. But yet, I am glad I read it. And I will likely think about it for a long while. I’ve read several of Austin Kleon‘s books and this has the same format as the others. It’s a little book, full of wisdom. I highlighted so many parts of the book that I am not sure I can capture all of them here. 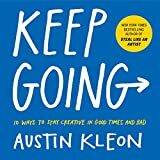 I am not a full-time artist, I don’t make a living on art, or even make any money, but as someone who has stopped spending time being creative in the last year, I knew this book would help get me back on track. – “If you wait for someone to give you a job title before you do the work, you might never get to do the work at all.” This is so true in so many areas. At my job, too! – Practicing art is helps make your soul grow. so important for me to remember! – i also loved the idea of visiting the past, reading old books, I should read some Seneca! – i also loved remembering that art (like many things) happens in cycles and that maybe i was in a quiet cycle for the last year or so. This is just a sampling of what I highlighted in this lovely book bursting with wonderful inspiration and quiet wisdom. It’s a book I will keep coming back to again and again. And there we go, a really solid week of reading. Pretty happy.